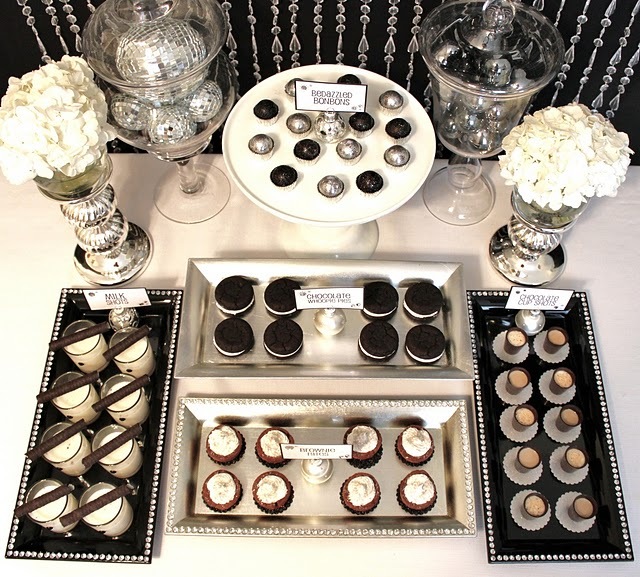 I couldn't wait to share this beautiful display of party tables from Chris Nease of Celebrations at Home today on my blog. 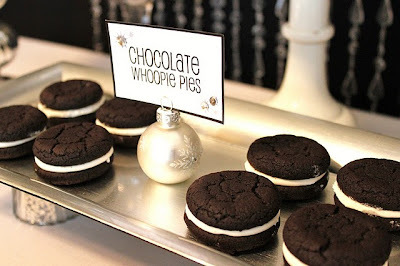 Chris publishes one of the best "must-see" party blogs on the web and has a true talent for putting together an unforgettable party. 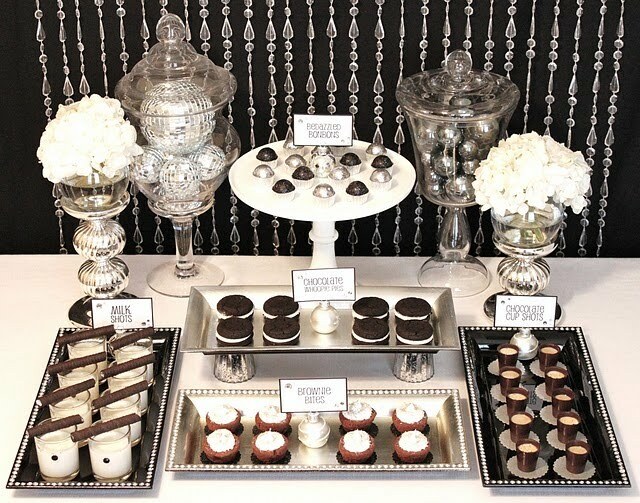 The first of her tables is a glamorous dessert table -- and best of all, she designed it with affordability and versatility in mind. It coordinates perfectly with another tablescape she designed for a Holiday Table Challenge put on by The Party Dress. 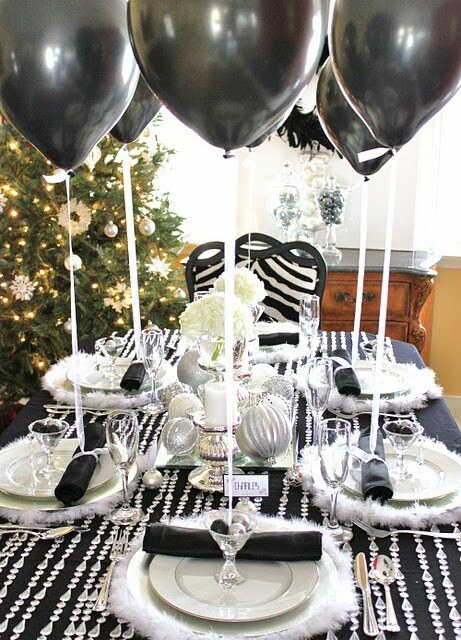 So thanks to Chris, we get ideas for both a dinner party table and a dessert table, and just in time for New Year's Eve party planning! I love how Chris takes the ordinary and makes it extraordinary. About her dessert table she says, "I wanted it to be glamorous and neutral enough to translate into other celebrations throughout the year (anniversary, special birthday, small wedding). What could be more glamorous than black & white & silver & shimmer?" Using mostly locally found store-bought items such as platters from Target and Michaels, mirrored ornaments, apothecary jars, mercury glass candle holders and a stunning acrylic tear drop curtain, Chris creates a beautiful dessert display, perfect for a small dinner party. To make entertaining easy, Chris uses grocery store items such as brownie bites, Oreo Cakesters and Oreo cookie sticks along side more glamorous desserts such as the stylish glittery bon-bons from Bedazzle My Bon-Bons. 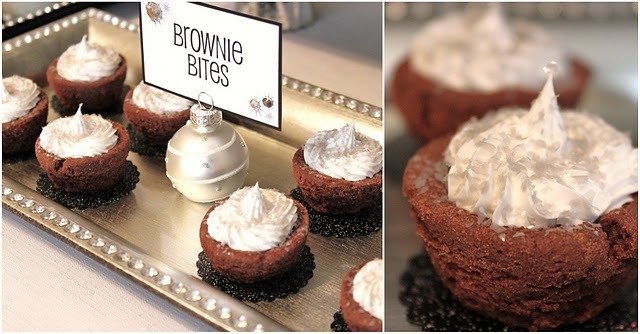 "I like the idea of choosing one or two designer desserts to shine, and then dressing up purchased items or homemade items to round out the table," says Chris. 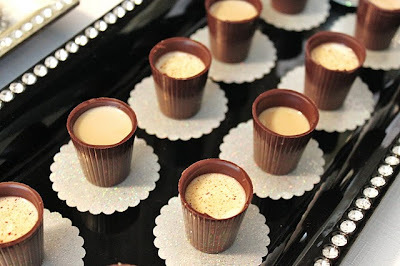 Chris also uses a fantastic chocolate mini cup to serve shots of spiked eggnog and Irish creme to add a little festive touch to the table. 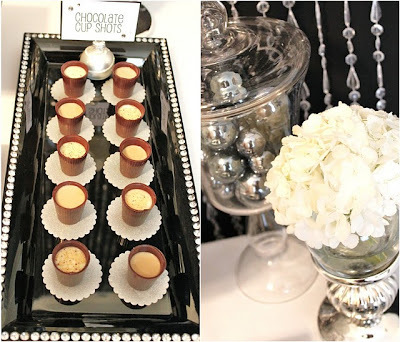 I love how she used glittery scrapbook paper punched with a scalloped craft punch to set each of the cup on -- the details do make the difference! 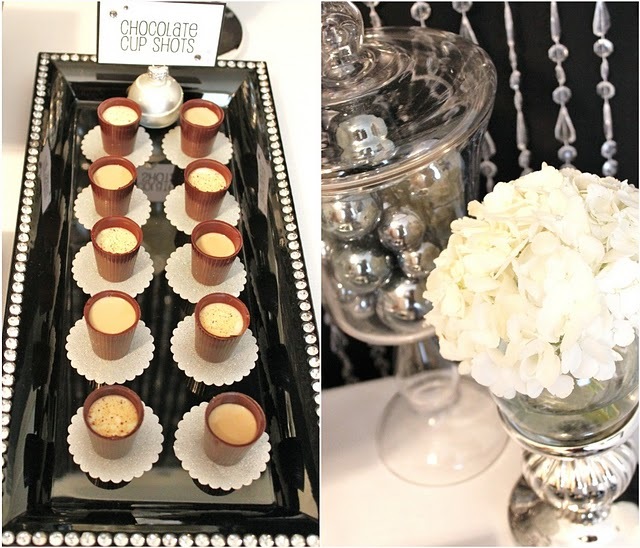 Adding a little sparkle to a store-bought dessert is an easy and quick way to make a dessert table special. Here, Chris uses edible glitter from Sweet Baking Supply. 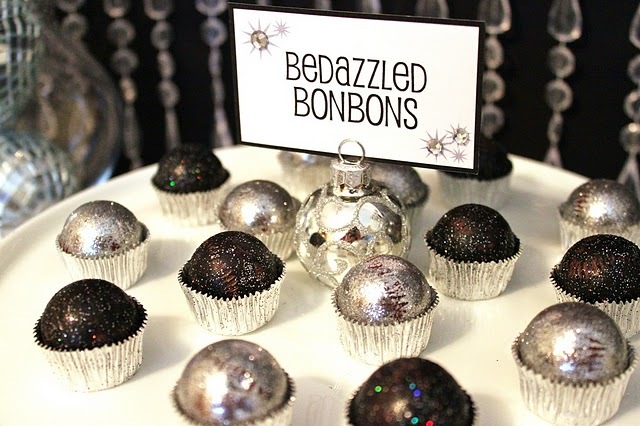 If you're crunched for time and can't order by mail, Hobby Lobby has some glittery baking decor as well. Another great and easy designer touch from Chris is the blinged-up shot glass. 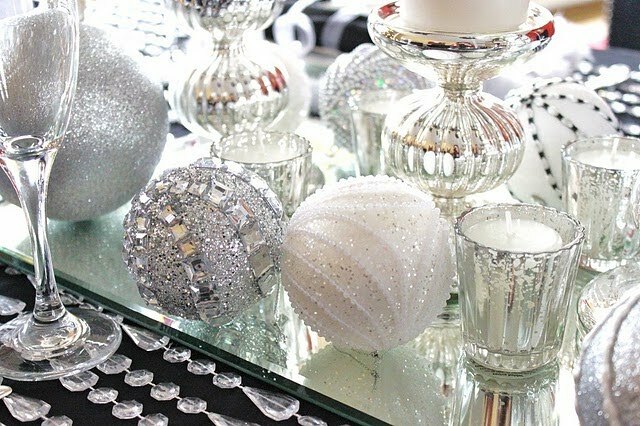 Take an ordinary shotglass and spruce it up a little bit with some craft store rhinestones and a little glue and wah-lah -- a perfect party accessory. And who doesn't love a cookie dipped in milk? 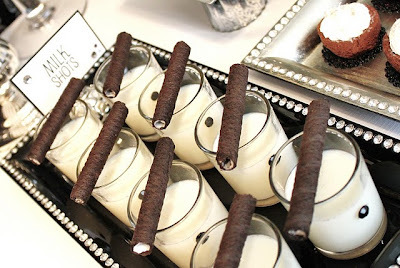 These cookie sticks are adorable and yummy, too. WOW, right? Who knew black balloons and a little bling could say so much? 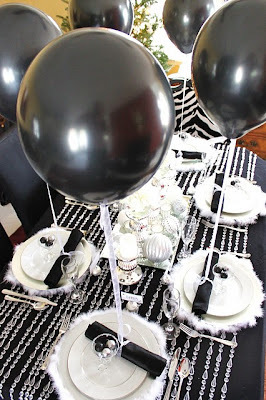 Chris uses ordinary black balloons as an eye-catching feature to her dinner tablescape for the Holiday Table Challenge at The Party Dress. 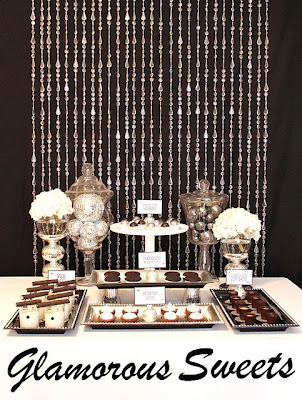 Repeating the acrylic beaded curtain feature from her dessert table, Chris this time uses it as a table runner. Brilliant! 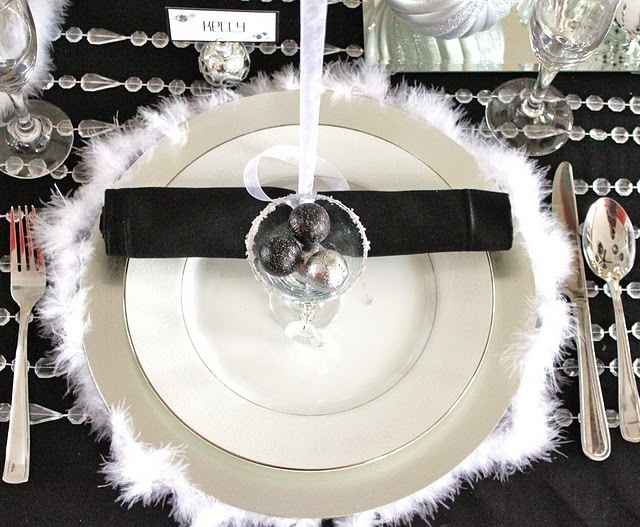 Adding a little white marabou around the plate chargers and lots of black, white and mirrored elements creates the perfect atmosphere for a truly special dinner party. 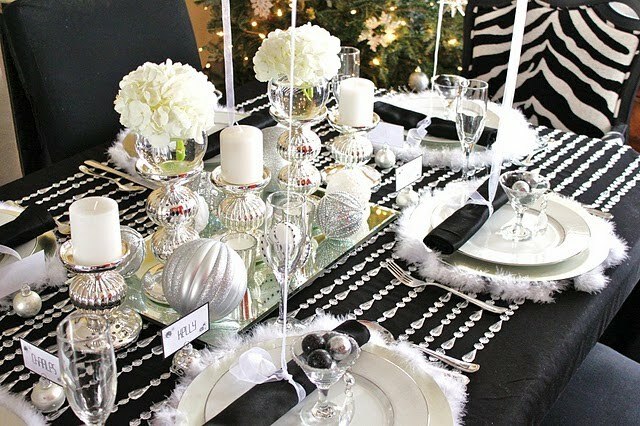 Thanks so much, Chris, for showing us all how to create a fabulous, affordable and do-able holiday party! You are such a talent! Make sure to visit Celebrations at Home, too -- it's a must read for anyone planning a party! Oh very gorgeous! Love the black and white with the sparkle! Those colors would look great with my mercury glass!